Will technology save or doom the human race? Has the Black Mirror TV show been cancelled or renewed for a fifth season on Netflix? The television vulture is watching all the latest TV cancellation and renewal news, so this page is the place to track the status of Black Mirror, season five. Bookmark it, or subscribe for the latest updates. Remember, the television vulture is watching your shows. Are you? 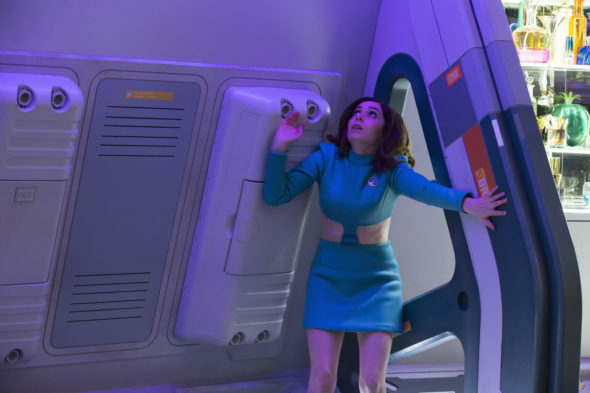 A Netflix sci-fi anthology series, the fourth season of Black Mirror stars Rosemarie Dewitt, Jesse Plemmons, Cristin Milioti, Jimmi Simpson, Andrea Riseborough, Letitia Wright, Maxine Peake, Brenna Harding, Owen Teague, Michaela Coel, Andrew Gower, Kiran Sonia Sawar, Georgina Campbell, George Blagden, Jake Davies, Clint Dyer, Douglas Hodge, and Babs Olusanmokun. The satirical psychological thriller delves into post-modern themes related to paranoia of technology. On March 5, 2018, Black Mirror was renewed for a fifth season, with a start date TBD. Stay tuned for further updates. Unless they decide to publicize viewership, it is difficult to predict whether Netflix will cancel or renew Black Mirror for season five. Back in September of 2017, however, creator Charlie Brooker and EP Annabel Jones said they’re willing to do another six-episode installment, so now Netflix finds the ball in its court. Flying blind, I think it will get a season five renewal, but I’ll keep an eye on the trades and update this page with breaking developments. Subscribe for free alerts on Black Mirror cancellation or renewal news. 3/5 update: Black Mirror is renewed for season five on Netflix. Details here. Find more Black Mirror TV series news or other Netflix TV show news. What do you think? Did you hope the Black Mirror TV show would be renewed for season five? How would you feel, had Netflix cancelled this TV series, instead?